Fig. 3. G protein receptor activation and coupling with adenylyl cyclase (AC) during ^-adrenergic receptor activation. 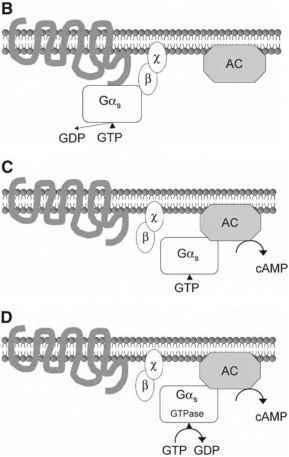 (A) The receptor is inactive; GDP (guanosine diphosphate) is bound to the a-subunit of stimulatory G protein. (B) The agonist binds to receptor, which leads to receptor G protein interaction; GTP (guanosine triphosphate) binds to stimulatory G proteins (a-subunit, Gas). (C) The G-subunits dissociate, and Gas stimulates adenylate cyclase, with subsequent formation of cAMP (cyclic adenosine 3',5'-monophosphate). (D) Gas guanosine triphosphatase (GTPase) becomes active, GDP re-forms, and the activation cycle ends. activate during hyperpolarization (more negative membrane potentials); (2) are responsive to cAMP; (3) are conductive for both Na+ and K+ ions; and (4) can be blocked by cesium. Cyclic AMP binding to the intracellular domain of these ion channels shifts their activation curves to more positive potentials, which increases the rates of "spontaneous" depolarization of sinoatrial nodal cells and ultimately their firing rates. The chronotropic effects can be mediated either via norepinephrine released from sympathetic nerve endings in the sinoatrial node or from circulating catecholamines (epinephrine and norepi-nephrine). From an integrative physiology standpoint, increasing heart rates is an adaptive response to an increased demand of oxygen and cardiac output in the periphery. Accelerating the heart rate will in turn increase cardiac output if stroke volume remains constant (Cardiac output = Heart rate x Stroke volume). 1. P-Agonist binds to either pr or p2-receptor. 2. GTP binds to the stimulatory a-subunit of the G protein (Gas) and activates it. 3. The G-subunits dissociate (the a-subunit dissociates from the P-subunit and x-subunit). 4. The a-subunit (containing GTP) stimulates the effector protein AC. 5. cAMP is formed, and GTP is hydrolyzed to GDP (gua-nosine diphosphate) plus Pi (the a-subunit/GTP is a GTPase [guanosine 5'-triphosphatase]). 6. The a-subunit/GDP binds to the P- and x-subunits, and the initial (inactive) resting state reforms. 4.2.4. The Second Messenger Concept cAMP is one of the key effector molecules in many of the signaling processes involving p-ARs (and in many other receptor systems). This molecule is commonly referred to as a second messenger and is one of many second messengers identified that are involved in cellular signal transduction. Another highly relevant second messenger is cyclic guanosine monophosphate (cGMP); cGMP is typically formed in vascular cells after binding nitric oxide, but is also formed in cardiac and other cells after binding natriuretic peptides (NPs). As the name implies, these molecules trigger additional signaling mechanisms. Importantly, cAMP is present in all cardiac myocytes; it is rapidly turned over, and there is a constant dynamic balance between cAMP generation and breakdown via phospho-dieasterases (enzymes that break down cAMP). Although cAMP can increase in response to ^-adrenergic activation, there are other pharmacologically active agents that can lead to increased cAMP levels via alternate mechanisms. For example, glucagon is known to stimulate AC via a non-^-AR mechanism; forsokolin stimulates AC directly; and phosphodieasterase inhibitors such as milrinone, amri-none, and others inhibit the breakdown of cAMP, resulting in increased cAMP levels. The exact mechanism of how formation of cAMP leads to increased cardiac contractility in cardiac myocytes is discussed in the following paragraphs. It is known that cAMP enhances the activity of protein kinase A. Once activated, protein kinase A causes phosphorylation of numerous proteins, including voltage-dependent sar-colemmal calcium channels, phospholamban (located in the sarcoplasmic reticulum), troponin I, and troponin C. The primary effect of phosphorylating the calcium channels and phospholamban is that this increases calcium influx during a cardiac activation cycle and increases calcium uptake by the sacroplasmic reticulum. Working in concert, these effects will ultimately result in increased calcium transients during cardiac excitation-contraction coupling. Further, these increased intracellular calcium transients will result in increased ATP splitting by the myosin ATPase (adenosine triphosphatase), which then increases the rate of development of contractile force (and increases deinhibition of actin and myosin by the interaction of calcium with troponin C), ultimately causing an increase in total cardiac force development. 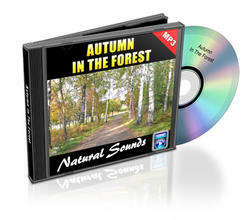 If this stimulation is maintained, this effect or response often becomes attenuated over time. Also, cAMP levels may decrease, for example, because of activation of calmodulin, which activates cAMP breakdown via phosphodieasterase activation and via activation of P-AR kinase (PARK activation and downregulation). It is important to recognize that the response to P-AR stimulation cannot simply be explained by overall increased tissue levels of cAMP. It has been speculated that cAMP may be compartmentalized in the heart, with a specific compartment available to increase contractility (5). In addition, it has been shown that both p2-ARs and prARs mediate positive inotro-pic responses independent of cAMP generation. This last response may, in some cases, be one of the myopathic mechanisms in chronic heart failure by resulting in increased systolic and diastolic calcium levels (6). The complexity of the P-AR stimulatory G protein AC signaling system can be further illustrated by the fact that there are approx 20 identified Gas, five P-subtypes, and 11 x-subtypes, in addition to 9 isoforms of AC (7). In cardiac tissue, isoforms V and VI of AC are considered to predominate. Specific anchoring proteins enable the juxtaposition of protein kinase A with its specific target proteins (A-kinase-anchoring proteins), which may account for the resulting compartmentalization (and complexity) of both physiological and pathophysiological responses. Fig. 4. The major intracellular signaling mechanisms involved in the regulation of cardiac contractility and relaxation following P-adrener-gic receptor activation. It should be noted that there is also the possibility that L-type voltage-dependent calcium channels can be activated via a direct effect of a stimulatory G protein (Gas) subsequent to P-adrenergic receptor (both P1- and p2-adrenergic receptors) activations. This overall signaling pathway is cAMP (cylic adenosine 3',5'-monophosphate) independent. The resulting increased systolic and diastolic calcium fluxes are considered to become a potentially myopathic mechanism in chronic heart failure. Phospholamban can be activated by protein kinase A (via cAMP) or by increased calcium levels subsequent to voltage-gated calcium channel activation (secondary to protein kinase A phosphorylation). This typical phosphorylation of phospholamban leads to increased activity of this enzyme, which then results in enhanced calcium removal from the cytosol back into the sarcoplasmic reticulum. It is known that the activation of troponin I, via protein kinase A, increases the rate of crossbridge detachment and relaxation. Importantly, both of these responses will increase the rate of relaxation, an active process to remove calcium from the cytosol. 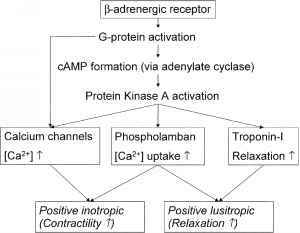 A basic summary of the mechanisms of P-adrenergic increase in cardiac contractility and relaxation is provided in Fig. 4. Activation of the voltage-gated (L-type) calcium channels in the atrioventricular node enhances conduction in these nodal cells as well as in the Purkinje fibers. In general, the metabolic effects mediated via the P-AR system include: (1) increases in glycogen formation (via increased glycogenolysis as well as decreased formation of glycogen); (2) the stimulation of lipolysis; or (3) increases in ATP production (via glycolysis/citrate cycle). Some of these metabolic effects may be mediated via the P3-AR (e.g., control of lipolysis). The P3-AR is also considered to have some regulatory function in cardiac (and vascular) contractility (e.g., negative inotropic effects) (8). The main physiological function of p-AR activation is vascular relaxation (vasodilation), which is induced via a reduction of cytosolic calcium levels in the smooth muscle cells composing these vessels, with relaxation having the greatest importance in arterioles. These relaxation responses are mediated via the p2-AR subtype and are antagonized by a-AR activation (aj -receptor subtype). The effects of a-receptor signal transduction are discussed further below. The most significant effects on dilation in the coronary artery bed are mediated via metabolic waste products (CO2 and so forth). To understand p-AR regulation best, it is useful to review the molecular structure of this receptor. Basically, the receptor is composed of three types of domains: (J) the extracellular domain; (2) the transmembrane domains, which are involved in the agonist and antagonist binding (ligand binding); and (3) the intracellular or cytoplasmic domains, which are important for G protein interactions and interactions with kinases such as P-ARK (Fig. 2). Receptor downregulation can be defined as a reduced presence in functional numbers of receptors in the cell membrane. Downregulation could result from internalization (and destruction in lysosomes), decreased rates of receptor degradation (nonlysosomal), or decreased synthesis. Desensitization can be defined as receptor refractoriness, a state of decreased activity following continued stimulation. Yet, it should be noted that one cannot always identify a clear distinction between these two definitions in the literature. For example, the p-receptor can become desensitized during isoproterenol stimulation (a classic pharmacological p-adrenergic agonist). In contrast, during continuous p-AR stimulation, the enzyme p-ARK increases its activity; p-ARK phosphorylates the cytoplasmic domain sites of the p-AR (Fig. 2) and is able to uncouple the receptor from the Gas (stimulatory G protein). This response acts as a block of the signal, and activation of AC is decreased; in other words, AC is uncoupled from the p-AR. Resensitization can occur once the receptor has been dephos-phorylated. This mechanism is called agonist-specific desensitization. Non-agonist-specific desensitization can occur via second messenger cAMP (and via diacylglycerol [DAG], which activates protein kinase A and C), which phosphorylates the G protein-coupled receptors. term use. This enhanced sensitivity is considered to be caused by receptor externalization. Another example is drug tolerance to dobutamine (or other p-AR agonists); the molecular mechanisms underlying this clinical phenomenon may be desensitization. Although agonist-specific and unspecific desensitization can be viewed as one of the classical concepts of receptor regulation, G protein receptor kinases, such as p-ARK and associated proteins (p-arrestins), seem to function by other mechanisms. For example, p-arrestins are considered to interact with a G protein-coupled receptor and thus inhibit further G protein coupling after the receptor has been phosphorylated by p-ARK. Even though this more traditional role is now well established, p-arrestins have also been shown to be involved in receptor internalization as well as complex additional signaling mechanisms (e.g., mitogen-activated protein kinase [MAPK] pathways) (9,10). Internalization (also known as sequestration or endocytosis) may serve various functions including: resensi-tization (dephosphorylation of receptor) and recycling; or altering signaling processes. Typically, the mechanisms of internalization involve the classically described clathrin-coated pit processes (caveolae) and also noncoated pit mechanisms. Another interesting role of p-arrestins is in ubiquitination; this is a means by which proteins are marked for subsequent degradation. For example, p-arrestin ubiquitination is important for pj-AR internalization; receptor ubiquitination is necessary for lysosomal targeting and degradation of the receptors (11). The gene regulation of the p-AR has been extensively reviewed elsewhere (7). The function of the p-AR signaling pathway not only is of great importance in the normal regulation of physiological cardiac vascular function, but also has critical, although different, roles in chronic heart failure. Heart failure is a syndrome defined by an inability of the heart to pump adequate amounts of blood to the body organs. The normal physiological response to an inadequate blood (oxygen) supply is to increase the cardiac output (and thereby oxygen delivery) via activation of the adrenergic nervous system (sympathetic nervous system); this response is characterized by an increase in circulating catechola-mines. Although this sympathetic response would intuitively be seen as beneficial, and indeed is also initially adaptive, in reality the sustained p-AR activation and increased norepinephrine tissue levels (12) are associated with negative biological effects. Therefore, a sustained p-AR response in fact may be considered both maladaptive and inappropriate. consistent with this notion, adrenergic drive is increased in virtually all chronically failing human hearts with systolic dysfunction, as well as in all animal models of hemodynamic overload. Thus, adrenergic drive can also be considered as a "servo-control" mechanism to maintain cardiac performance at an acceptable level (7). On the molecular level the proportion of pj- to p2-adrenergic subreceptor populations in normal human ventricles shifts from 75/25 in diseased human ventricles to about 50/50 in normal human ventricles (13). Both receptor subtypes are typically desensitized because of uncou pling of the receptors from their signaling pathways associated with increased p-AR phosphorylation as well as upregulation of the inhibitory G protein, Gi. To illustrate the maladaptive p-AR signaling response, it is important to consider that p-adrenergic agonists, given to patients with chronic heart failure, may actually increase mortality. In contrast, the administration of p-blockers has been shown to improve survival; p-AR blockers in 2003 were one of the cornerstones of medical/drug therapy for patients with chronic heart failure. In certain patients with cardiac failure, there is a situation in which increased adrenergic drive is required to maintain the circulatory needs of their bodies. The more the heart is activated adrenergically, the more profound are the effects of desensiti-zation, which in turn activates the adrenergic system even more, ultimately causing myocardial tissue damage. Based on the studies in which p-AR blocking agents were administered, it is generally believed that the p-AR system is central in this vicious (pathological) cycle, which is commonly characterized by progressive remodeling and myocardial dysfunction. One of the hallmarks of chronic heart failure is adrenergic overdrive leading to p-AR downregulation and desensitization. In particular, pj-ARs have been shown to be downregulated selectively; the p2-ARs are relatively increased, so that as mentioned above, the population of pj to p2 shifts from 75/25 to about 50/50. The marked uncoupling of the p-AR receptors from the G proteins is attributable to increased levels of p-ARKJ, as well as increased inhibitory G protein (Gi) (14). This in turn results not only in attenuated p-AR signaling, but also in activation of additional pathways involved in ventricular remodeling (see below). The shift of the pJ/p2-AR subpopulation to an increased number of p2-receptors is only one of the phenomena associated with chronic heart failure. More specifically, p2-ARs couple to a number of signaling pathways, including a potential coupling to an inhibitory G protein (Gai). Also, p2-ARs may modulate several G protein-independent pathways, including inhibition of sodium-hydrogen exchangers as well as a non-protein kinase A-dependent interactions with L-type calcium channels (15,16). There is a variety of other G protein-independent pathways in which the p2-ARs have been implicated, such as those associated with phosphatidylinositol kinase, phospholipase C/ protein kinase C (PKC), or arachidonic acid signaling. And, although many details of these mechanisms remain poorly understood, it is becoming more clear that some of these pathways may also play important roles in the molecular pathobiology of heart failure. One of the widely recognized mechanisms of p-AR desensitization is agonist-dependent p-ARK-mediated phosphorylation of the p-AR itself. Moreover, the p-y-subunits of the G proteins can act as signaling molecules themselves, with the potential of activating many downstream targets of pathways, such as ACs, PLC, PLA2, PI3K, K+ channels, or Src-Ras-Raf-MEK-MAPK (7). Source: Modified from ref. 1. AR, adrenergic receptor; ARK, adrenergic receptor kinase. agonist or receptor overexpression leads to increased cardiac apoptosis (programmed cell death) (17-19). The mechanisms by which such apoptosis is activated has been attributed partly to initial activation of calcineurin via increased intracellular calcium through L-type calcium channels (20). In addition, direct toxic effects of catecholamines on the myocytes have been described as a result of direct p-AR activation (12). Other effects of chronic p-AR signaling include production of cytotoxicity via calcium overload, increased free-radical formation, as well as stimulation of pathological hypertrophy (7). For example, the marked uncoupling of pj- and p2-receptors from their physiological signaling pathways not only results in attenuation of the p-AR signaling, but also allows for the coupling of the receptors with other (possibly myopathic) signaling pathways involved in ventricular remodeling (MAPK and PI3K cascades). As alluded, p-receptor antagonists may be beneficial in chronic heart failure. Specifically, the pj-specific p-AR blocking drug metoprolol produces reverse remodeling similar to a combined a-p-blocker carvedilol, suggesting that pJ-AR receptor signaling is an important determinant of pathological hypertrophy in human heart failure (21). Last, genetic heterogeneity in expression of the p-AR in the general population has been identified, which may affect disease susceptibility. For example, a substitution of threonine to isoleucine at amino acid 164 in the p2-AR has been associated with reduced survival and exercise tolerance in patients with heart failure (22,23). A summary of the known changes in p-AR signaling is provided in Table 3. It should be mentioned that investigations using transgenic animal models have greatly helped elucidate some of the important disease mechanisms associated with adrenergic receptor reception pathways; they have also served as tools in identifying and testing novel or evolving therapeutic targets for the treatment of heart failure (1). and activation of both PKC and MAPKs. Physiological receptor agonists include norepinephrine and epinephrine, and a Gq protein is the primary associated G protein (24). In general, the primary physiological importance of arreceptors is far greater in the vasculature, leading to calcium influx and vasoconstriction via the second messenger InsP3. In cardiac muscle cells, aj -receptors have been shown to induce a positive inotropic effect; this response is associated with formation of InsP3 (25). The a2-receptors have been identified on coronary vessels and in the central nervous system (presynaptic); they reduce the activity of AC (and protein kinase A) via an inhibitory G protein. In summary, the primary physiological role of aj-receptors is within the vasculature for the regulation of vascular tone via vasoconstriction, which is secondary to calcium influx into the smooth muscle cells of the circulatory arterioles. In general, in patients with heart failure, the aJ-AR system will elicit an increase in receptor density and is also characterized by changes in inotropic responses (26). In addition, aJ-AR activation promotes cardiomyocyte hypertrophy via activation of hypertrophic MAPK pathways. Repeated increased workloads on the heart lead to cardiac hypertrophy. Hypertrophy is characterized by increased contractile protein content (and muscle mass), myofilament reorganization, and reexpression of embryonic markers. As discussed, myocyte cell growth by G protein-coupled receptors may involve not only ras and MAPK pathways, but also other signaling pathways (e.g., calcineurin, P-I3-K and phosphoti-dylinositol-3-OH). Abnormal p-AR function with hypertrophy is also characteristic; in particular, elevated myocardial levels of p-ARKJ can be detected (27). As mentioned, aj-receptor signaling also may be very important in the development of cardiac hypertrophy. Specifically, Gq-coupled receptors, such as angiotensin, a-J-AR, and endothelin, can all activate hypertrophic MAPK pathways (28,29). To summarize, the cardiac hypertrophic response may not be compensatory to reduce wall stress, but rather maladaptive, thus increasing mortality. In particular, signaling pathways involving catecholamines (norepinephrine and epinephrine) and Gq-coupled receptors seem to activate hypertrophic responses. Targeting these specific signaling pathways may be a novel therapeutic approach for the potential treatment of "maladaptive" cardiac hypertrophy and ultimately heart failure. For further details on this topic, refer to the review by Rockman et al. (1). The muscarinic receptor system in the heart is also an associated G protein-coupled receptor system. The main cardiac receptor subtype (M2 receptor) is a cholinergic receptor, and thus it mediates primary parasympathetic (cholinergic) nervous system responses. 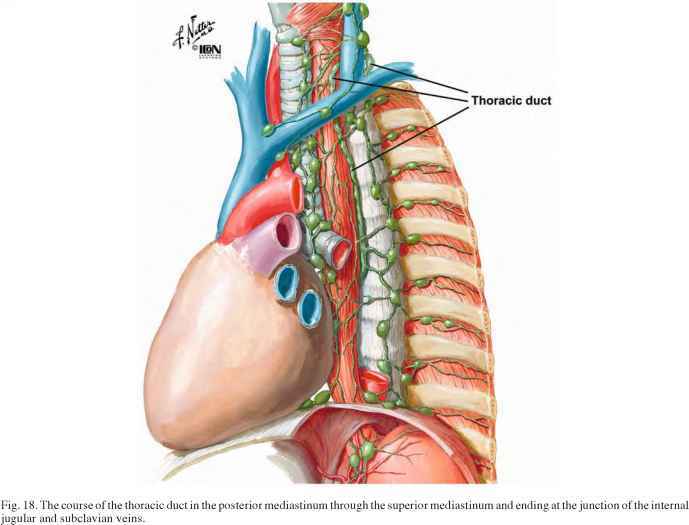 Its general function is to balance and antagonize the sympathetic effects of p-AR activation simultaneously, with its most pronounced effects on the controls of the sinoatrial (heart rate, chronotropic effects) and atrioventricular nodes (conduction, dromotropic effects). There exist very few muscarinic M2 receptors in the ventricles, hence activated negative inotropic (contractility) effects subsequent to M2 receptor activation are very small. A typical control signal mediated via the vagus nerve leads to a local release of ACh in the sinoatrial and atrioventricular nodes. ACh then binds to the M2 receptor, activates an inhibitory G protein (Gai), and essentially decreases the activity of AC, which directly leads to opening of K+ channels. In the sinoatrial node, vagal stimulation tends to flatten the diastolic depolarization, which then induces a slowing of heart rate (bradycardia, negative chronotropic effect), possibly not only via the effects of reduced cAMP availability on If current (hyperpolarization activated cyclic nucleotide-gated channel), but also via activation of a potassium outward current, which in concert decreases the spontaneous firing rate of the sinoatrial node. In the atrioventricular nodal tissue, vagal stimulation also activates an inhibitory G protein, which causes a slowing conduction velocity via a decreased calcium influx through L-type calcium channels. Clinically, the effects of vagal stimulation on the atrioventricular node are detected as increased atrioven-tricular nodal conduction times (e.g., prolonged PR interval). The M3 muscarinic subtype is primarily found in vascular smooth muscle cells. Its activation leads to contraction of vascular smooth muscles via a Gq/11-PLC-InsP3-mediated calcium influx (as well as DAG/PKC, cAMP elevation). There is a variety of other G protein-coupled cardiovascular receptor systems that have important roles in cardiac physiology and pathophysiology. It is beyond the scope of this chapter to review all these systems in detail, but for comprehensiveness, a representative list of nonadrenergic and nonmuscarinic G protein-coupled receptor systems and their respective functions considered important is provided in Table 4. Cross talk between receptors refers to a biological phenomenon by which interactive regulatory (or modulatory) messages are sent from one receptor to another. Many of the aforementioned receptor pathways are engaged in some degree of cross talk, which is commonly via second messengers and/or protein kinases, which in turn modulate G protein-mediated messages. Although the current understanding of receptor cross talk is far from complete, it is clear that receptor cross talk is integral for sustaining a coherent function of the cardiovascular system and has implications in both normal physiology and cardiac disease states.